February the month of love is upon us. 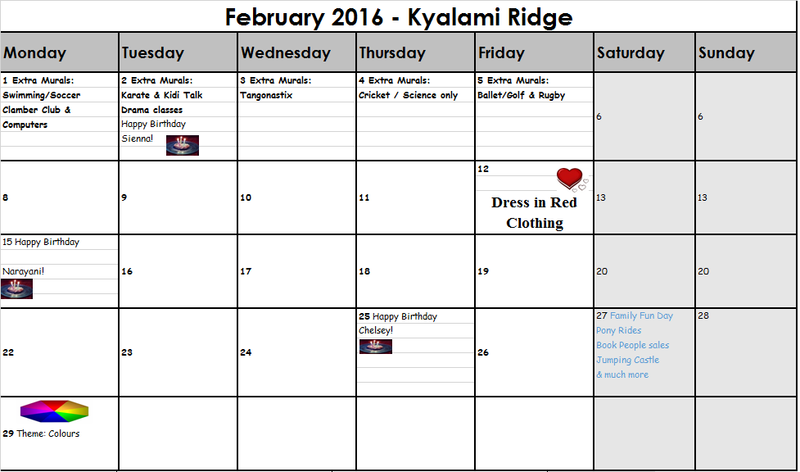 On Friday the 12 February we will be having a dress up to celebrate Valentine’s day. The children must dress in red clothing. This is the first of our Educational Friday Fun Days. We will be focusing on the Colour Red and the Heart Shape. On Saturday 27 February is our Family Fun Day at the School from 9:00 - 12:00 noon. The parents are invited to bring a picnic basket, chairs and umbrella. There will be a jumping castle, pony rides, and other entertainment for the children. The Book People will also be displaying their books . The aim of the family fun day is for parents and children to connect with each other in a fun and informal manner. The speech therapist and audiologist have screened the children and if they have picked up a concern you will be notified. Thank you to all the parents who attended the “Meet and Greet”. We appreciate the proactive and positive feedback that was received. If any parent still would like a to formally meet their child’s teachers we can gladly arrange this. See this link for the Parent Manual containing information and the school policies. The teachers are strictly not allowed to use their cell phones during working hours, so communication via cell phone calls, SMS, whats App, Facebook and Emails to teachers, etc. 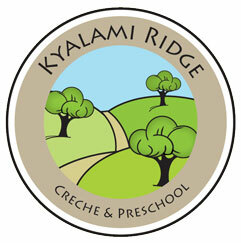 is strictly forbidden at Kyalami Ridge Crèche and Preschool without the Principal’s permission. Creative Drama has been added to the extra-curricular list. If any parent/child is interested there are forms available to be completed. Creative Drama will be held on Tuesdays at 9:00am. The extra mural lists have been put up outside the teacher’s classrooms. Please tick them A.S.A.P. so we can finalize the extra mural activities. If you are not sure what extra mural to enrol your child into please ask your child’s class teacher for advice. Please note that the extra murals are not necessary or compulsory as the school does follow a very balanced educational programme. One or two extra murals are enough as the children do get very tired and we do not want to overburden the children. Please discourage your child from bringing toys to school. It just causes conflict and upsets children when the toys get broken or lost. We do have a large variety of interesting toys for the children to play with at the school. Debora Nyoni has been in the apparel industry for over 20 years with a speciality in creating curtains and bed linen. Contact her for your specific interior decor needs at exceptionally affordable rates. Learn to understand with your heart, not your eyes, ears and mind. - from the freely gifted book Love, Life, Laughter.